Before we discuss potential solutions for coordinating development and design teams, let's examine our problem on a granular level. First of all, it's important to remember that the development team is not a monolithic engine that delivers code; instead, it is usually composed of several groups, including front-end specialists, back-end specialists, quality specialists, and so on. It's already challenging enough to get each of these development teams, all of whom have common software engineering backgrounds, to coordinate. Frequent complaints about Waterfall gaps between development and QA exemplify this challenge well. The problem is naturally magnified when a UX design team is introduced into the equation. 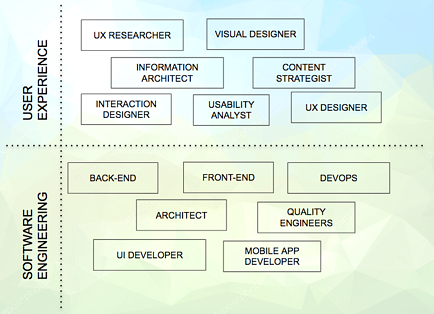 Just like software engineers, UX design teams have evolved into specialized groups. Today you can find research specialists, prototype specialists, information architecture specialists, and, of course, usability test experts. Depending on the complexity of your project, you may need to involve all or at least a few of these teams in your project. The problem I want to address here is the very different nature of software engineering development and UX design activity. Each team has its own distinct methods of planning and creating, its own sets of rules and best practices, and its own training backgrounds and values. Because of this, UX design activity doesn't fit well within the event framework of an Agile project. For instance, if we were to strictly follow a Scrum framework, a UX designer inside a development team would have to use a maximum of 10% of his time to refine a story so it would be ready for estimation in a planning meeting. UX activity, however, differs from development team activity because its responsibilities focus on grooming (tasks such as interviewing users, creating personas, drawing user journeys, writing user stories, etc.) These grooming tasks sometimes have more similarities with product owner responsibilities than development responsibilities. Given these differences, a problem might occur if, for instance, a UX designer was asked to estimate a given story during a sprint planning meeting. This request would be counter-intuitive given the exploratory nature of UX activity, which often requires in-depth analysis that could extend the developer's work for a period of time that's difficult to estimate. For this reason, the timing of some UX activities may have to precede the development sprint. In recent years, various approaches have been proposed to formalize this peculiar condition of UX activity within a Scrum framework in a way that's organic to UX design work. In part 2 of this post, I will present some of these approaches that could help establish a way to organically coordinate UX teams and development teams within an Agile development context. Alexandre Lemos is a UX consultant, information architecture specialist and certified PSM at Avenue Code.